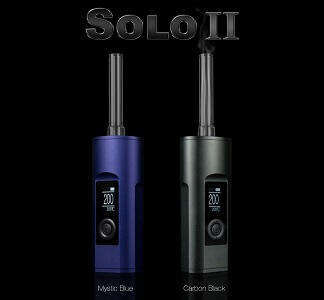 We are proud to bring you the fantastic Arizer Solo II Vaporizer! From one of the world's best vaporizer manufacturers, we are proud to bring you the Solo II; a hot contender for best vaporizer 2018. Canadian company Arizer have always been at the forefront of the herbal vape industry and, along with the Air II, this is their latest outstanding offering (see my other listings for the Air II). it keeps the same ceramic heating element, stainless steel oven and glass aroma tubes of the original Solo (which ensures that your herbs only ever come into contact with glass, which produces fantastic vapour flavour), but that is pretty much all the Arizer have kept from the previous model. It now has far better temperature control, and a full LCD display for far more control over settings. The battery life is much improved, but the Solo II is also much more efficient in comparison to the original Solo, allowing about 20 sessions on a single charge. The charger itself is much improved and will charge from flat to full capacity in around 3 hours and will pass-through to allow use while charging! * 2 year warranty on the unit, lifetime warranty on the heater, limited 1 year warranty on the battery, no warranty on any glass parts.